What if you can use youtube with more features. Know you may be thinking that, what restrictions are there in youtube, its free isn’t it. With Youtube++ ipa for iOS 11.1.2 and iOS 11, you get a lot of features that stock youtube does not offer. One of the best features is you can download Youtube videos on your iPhone or iPad. Well its not just that, you can also block ads on video, watch age-restricted videos without signing in. In short youtube++ IPA is tweaked version of youtube that offers a lot. By the way, also checkout FIlzajailed File manager with full root access for iPhone or iPad. The best thing about Youtube++ iOS 11 or 11.2.1 is you can install it without jailbreak. For doing this you would need a PC or Mac, Cydia Impactor tool for sideloading ipa file on your iOS device. Full instructions to do this process are explained further below. Moreover, if you are a regular youtube user than this app with be very useful for you. Its features are just amazing. 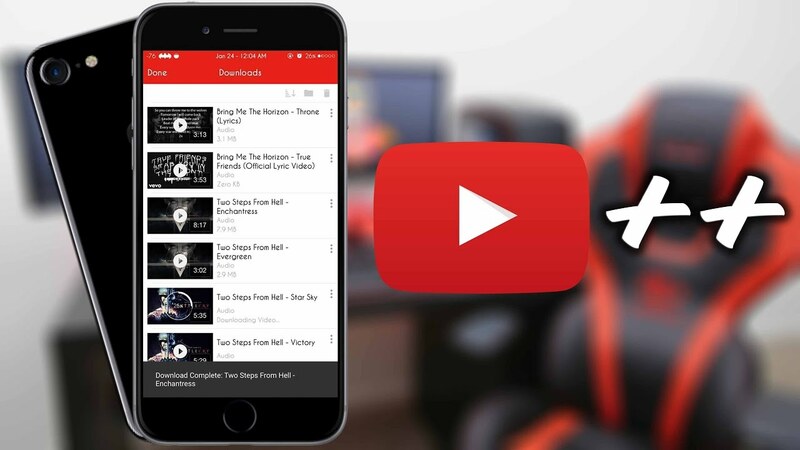 With youtube downloader feature that it has, one of the biggest all-time problem has been solved for downloading youtube videos on iPhone. Youtube++ for iOS 11 works very well and you can install it on any iPhone or iPad with iOS version 11, 11.1.1 and 11.1.2. It is a tweak for youtube that adds more functionality and uses. Such as, you can block ads, play video as mp3 in the background, youtube red for free using Youtube++ iOS 11.1.2. You can also download videos as mp3 or whole playlist. For installing this tweak on you can first download the youtube++ ipa file and after that, follow the step by step instructions below. I will also show you how to install it without pc. There some cool features of this youtube tweak. Download full youtube videos on your device directly. Or you can download whole playlist. Block any ads that appear on videos. Remove age restrictions from videos. That means you can play age restricted content without signing in. Enjoy youtube red features for free. Play videos in the background as mp3 or save the videos as mp3 on your device. And a bunch of other which you will only get to know after installing this app. Do the steps below to install this on your phone. First of all Download youtube++ file from above link. Now Download Cydia Impactor from above link. Keep both files on your PC or Mac, not on phone. Click and drag Youtube++ ipa file on to Cydia Impactor. Cydia impactor will ask you to log in. Put in your Apple id username and password here. Youtube++ for iOS 11 will now install on your device. Launch the app on your phone and enjoy. So, by following above steps, youtube++ ipa tweak will be installed on your phone. Wait, I might have a bonus tip for you. You can actually install it withou pc also. Refer to below instructions. To download Youtube++ without PC. You can follow below steps. First of all install tutuapp iOS 11 on your iPhone or ipad. Use the search bar and search for Youtube++. 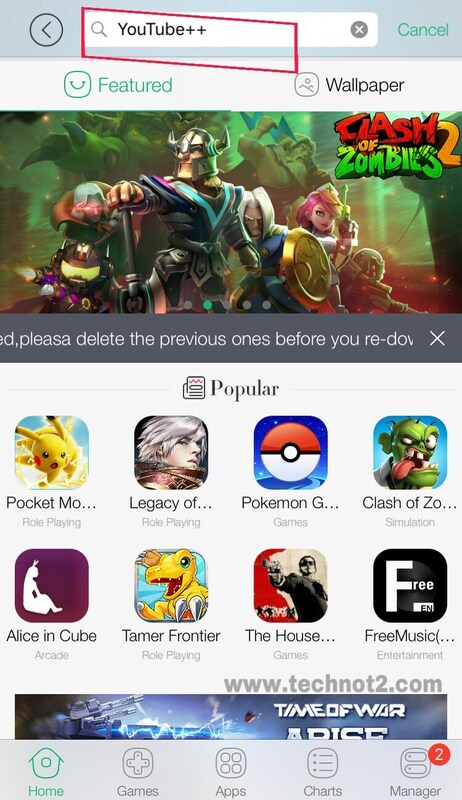 In the search results you will find the app listed. Go to Settings>>Genral>>Device Management and trust the profile of recently installed app. Launch the app and enjoy. That is it. Hope you like this tutorial to install youtube++ ipa on iOS 11 or 11.1.2 without jailbreak. Comment below for any queries. And subscribe to our blog for mor tweaked ipa files.